The Knicks landed Derrick Rose in a blockbuster trade Wednesday, but the Bulls may have gotten the best player in the deal. 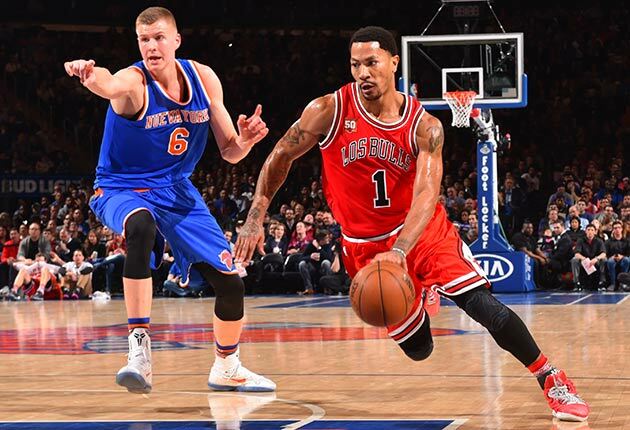 To analyze the deal, SI.com's Ben Golliver dishes his trade grades for both the Knicks and Bulls. The writing has been on the wall in Chicago for months: Trying to keep both Derrick Rose and Jimmy Butler happy in the same backcourt was proving to be an exercise in futility, and Rose’s injury history, coupled with his increasingly inefficient play, made him the more expendable of Chicago’s two max-money guards. New York clearly sensed an opportunity to acquire a “name” player who fills a position of major need and was available at a low price.“Derrick is one of the top point guards in the NBA who is playoff-battle-tested,” new coach Jeff Hornacek claimed in a press release. That’s simply not true. While Rose, 27, was the 2011 MVP and an All-Star as recently as 2012, his long history of knee issues has left him a shell of his former self. Last season, he managed to play 66 games—after playing just 100 combined in the previous four years—but he graded out well below average at his position by the major advanced metrics. According to ESPN’s Real Plus-Minus, Rose’s -4.23 RPM ranked No. 81 among 85 point guards, topping only walking disaster Ty Lawson among players who appeared in at least 60 games. • Open Floor Podcast: NBA draft stock watch: Buy or sell top prospects? Rose suffers from a number of major flaws at this point of his career: he can’t shoot from the perimeter, he can no longer break down a defense and get to the line like he did during his best seasons and he’s regressed considerably as a finisher. Making matters worse, he posted the worst defensive rating of any Bulls player who logged at least 1,200 minutes last season. With a 2016–17 salary of $21.3 million, Rose is in line to inherit the “Most Overpaid Player in the NBA” mantle from Kobe Bryant. New York will hope that Rose can benefit from a change of scenery and that his recognizable name will inject some excitement into a roster that’s incredibly lacking beyond Carmelo Anthony and Kristaps Porzingis. That approach might prove successful on some nights, but it will make life even more difficult for Hornacek, who favored an up-tempo approach in Phoenix. With both Rose and Anthony expected to play major roles, the Knicks will need Hornacek to pursue a new style. Ultimately, Rose represents one more fit question for the Knicks, who were already overloaded with fit and philosophical questions before this trade. Rose looks nothing like a triangle point guard and he’s not an Eric Bledsoe-type pressure defender that Hornacek is accustomed to. He will also need to strike a star balance with Anthony—after failing to do the same with Butler—while also being the person most responsible for guiding Porzingis’s development. That’s asking a lot from a player who is three surgeries removed from his best years and who enjoyed his greatest success as the focal point of an offense rather than as a playmaker for others. The loss of the dependable Lopez shouldn’t be overlooked: His departure creates a giant hole in the middle for New York, who ranked No. 18 in defensive efficiency in large part because Lopez was able to stay healthy for all 82 games last year. Barring a major acquisition this summer or a significant step forward from Porzingis as an interior defender, the Knicks are in line to struggle mightily on defense next year. The good news for New York is three-fold: Rose fills a gigantic hole at point guard and he should be able to fashion a functional pick-and-roll partnership with Porzingis, his name recognition dramatically increases the team’s relevancy and he isn’t owed any money past 2016-17. If he disappoints next season, at least he was more entertaining than Calderon. If he gets injured again, the Knicks can move on and go fishing again next summer. There may very well be genuine excitement around this move, given Rose’s star power and his successful past. His play, at this point, simply doesn’t warrant it. Really, this move comes off as all sizzle and no steak, a somewhat desperate play by a front office that seems to lack a clear direction. It was time for a divorce. Kudos to the much-maligned Bulls front office for pulling the trigger on a Rose trade rather than dragging out the inevitable and hoping that the Rose–Butler duo would somehow be able to make things work the third time around. Moving Rose out turns over the franchise to Butler, a foundational two–way star who thrived in Rose’s absence during 2014–15. There’s still reason to question whether Butler is an ideal fit in coach Fred Hoiberg’s pace-and-space style, given last year’s disappointing campaign, but at least the show will be designed around him now. From a financial standpoint, the move is a wash in 2016-17, as the combined salaries of Lopez, Calderon and Grant are roughly equivalent to Rose’s salary. Chicago did take on two additional years for Lopez ($13.8M in 2017-18 and $14.4M in 2018-19), but the big man is worth that price in the right system and he is a liquid asset. The Bulls can reasonably argue that by acquiring Lopez, who averaged 10.3 PPG and 7.3 RPG while posting a 17.6 PER last season, they got the best player in this deal. He excels at the little things—screen-setting, rim protection, offensive rebounding—that are crucial for a team with ambitions of returning to the postseason. Moreover, Lopez represents a bridge to the future in the event that unrestricted free agents Joakim Noah and Pau Gasol move on this summer as expected. At the same time, the slow-footed and robotic Lopez is a questionable fit stylistically if Hoiberg is serious about instituting an up-tempo style. Given their projected 2016–17 depth chart, the Bulls will need to strike a compromise approach that puts Lopez in a position to be successful, otherwise their interior defense will be springing serious leaks. They’ll also need to target a starting point guard to play a secondary role to Butler, as the 34-year-old Calderon isn’t the long-term answer to any team’s questions. In short, this move leaves Chicago with some work to do. Importantly, though, it sets a clear new direction for the franchise, one that doesn’t involve looking back on Rose’s past successes or clinging to the impossible hope that Rose will be able to reclaim his glory days. After spending a year in purgatory after firing Tom Thibodeau last summer, the Rose-less Bulls will finally be able to turn the page.